« Can you say Condom??? I finished my dinner tonight and went to bathroom to wash my mouth. As always happens I was not happy with the dinner. I am trying to get rid of this bad habit. When I opened the tap my eyes just went on to the wall. There was this creature which looked familiar. But there was something missing. A close look confirmed that it was snail. It’s been a long time since I saw snail. Earlier they were in plenty around my house. Just like the missing touch me not, I am lucky to find these. Surprisingly the missing touch me not just grew outside my house. Now here was the time for snail to show his presence. It is not that I am attracted towards such silly things, but I love to have them around. As I told you, there was something different in this snail. I am not zoologist or have studied a subject that is specialized in animals and insects. I am a science student though. So I don’t knew the reason behind the specialty. This snail was not covered. It was not having the armor that protects the soft body. It is similar to tortoise. It must be a part of growth. We change over the time and so do they. Please correct me if I am wrong. 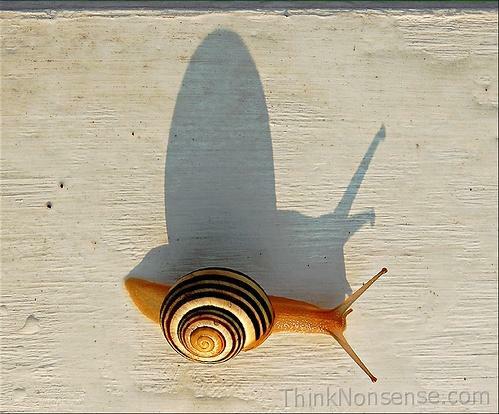 I like the slowness of snail. It is a pleasure to watch. The slow and steady walk calls me to live life like that. But I don’t listen. Imagine a slow and steady life covered and protected. That is not me. Sorry snail. Not to hurt you. If your life is all mess then it’s time to learn from snail. Now one guy will come up. He will be sleeping in couch doing nothing. If I ask him he’ll say he is following snail. He is getting slow and lazy just like snail. Now I didn’t meant that. Just don’t take the wrong meaning. With this post I, for the first time, took an image from flickr. The photo is shot by Mr Bones. I haven’t asked for permission as it’s not mentioned that it’s copyrighted. Just wanted to mention him.